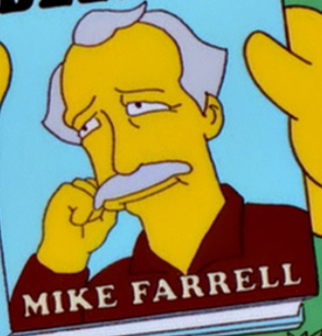 Mike Farrell is an American actor. When Marge asked her neighbors about the last episode of M*A*S*H one of the neighbors said that Mike Farrell really boils her potatoes. Lisa gave Homer a copy of Farrell's autobiography, My Core Beliefs, to inspire him when he started his hunger strike. When Homer started reading the book he said (regarding Farrell), "Man, he really hates Wayne Rogers." On the M*A*S*H TV series, Mike Farrell played B.J. Hunnicutt, Hawkeye Pierce's bunkmate. Farrell joined the cast of M*A*S*H at the beginning of the fourth season, replacing Wayne Rogers, who played Trapper John McIntyre. Rogers left the show after the third season. It's unclear why Farrell would dislike Rogers; however, Homer being Homer, it's entirely possible that he (Homer) misunderstood something in My Core Beliefs and came to that conclusion based on his misunderstanding. Modified on August 23, 2017, at 22:04.